Don’t let the fact that it won multiple Tony Awards (including Best Musical) fool you. This show is not for everyone but for those who like rude, disrespectful and outrageous, “The Book Of Mormon” fits the bill. There’s an attempt to put an almost respectful spin on the religion they’re satirizing in particular and those they are implicating along the way but don’t let that fool you either. There’s no help, however, for those who are sensitive to the rude and outrageous parts of the musical. But the show is so darn funny that you can’t help but laugh at the silliness that’s going on despite yourself. The no-holds-barred humor of creators Trey Parker and Matt Stone is well known through the lengthy run (and still going strong) of their potty-mouthed little youngsters from “South Park.” So we can have little sympathy for those going to this one and expecting “The Sound of Music.” From crude gestures to questionable practices of Ugandan natives to song lyrics that will stand your hair on end, “The Book Of Mormon” doesn’t take it easy on an audience. But, if you’re in the right frame of mind, you’re in for a treat. Mark Evans shines as the young missionary, Elder Price, who gets assigned to a two year stint in the jungles of Uganda. He has high ideals toward saving souls but even higher ideals about himself. When he is paired in the mission with a geeky, low self esteemed Elder Cunningham, he makes it quite clear that they will cut quite a swath- but mostly him. Christopher John O’Neill is a find as Elder Cunningham. He never comes across as obnoxious or overpowering but has a child-like innocence that immediately draws the audience to him. Samantha Marie Ware is also outstanding as the chieftan’s daughter who takes a shine to Elder Cunningham. Their unusual “love” duet is one of the funniest in any musical with double entendres galore. Derrick Williams is a riot as the terrorist general- with a most outrageous moniker. This is truly an ensemble cast, however, as our dynamic duo meet up with several other missionaries who have been stranded in Uganda for some time with nary a baptism or convert to show for it. Then the colorful assortment of natives who inhabit the little village include everything from a suspicious suitor to a man with an unusual hygiene problem. But you really have to see them all to appreciate this wildly talented cast of singers and dancers. “The King and I.” It’s all wrapped up in typical- if unusual- musical comedy fashion as the natives become the latest recruits of doorbell-ringing Mormon missionaries. I’ve used two words quite a bit in this review- outrageous and unusual. And that about sums up “The Book Of Mormon.” It can’t be emphasized enough that you have to know what you’re getting yourself into when you attend this one. It’s wonderful and entertaining, but if you’re easily offended by bad language, obscene gestures or inappropriate actions and suggestions, stay away from the Fox Theatre for the next few weeks. 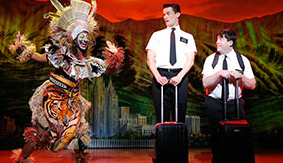 “The Book Of Mormon” plays at the Fox through March 3rd. Call Metrotix at 314-534-1111 for tickets. This entry was posted on February 22, 2013 at 9:43 pm02 and is filed under Uncategorized. You can follow any responses to this entry through the RSS 2.0 feed. You can leave a response, or trackback from your own site.